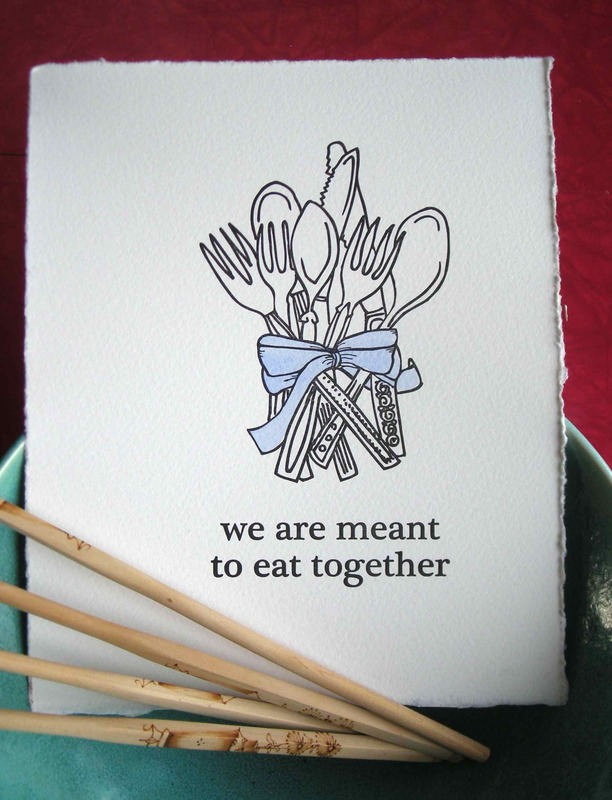 “We are meant to eat together” is a letterpressed print with blue watercolour accents. I believe that we are meant to eat together and share food. There are so many ways- a weeknight potluck with friends. Cooking in bulk at a neighbourhood house to share the work. Finding 30 minutes where all of the family is sitting at the same table, and learning about each other’s days. At a community kitchen, in your restaurant, or over Sunday dinner, however it works for you, I hope you have the opportunity to eat together. I have added watercolour highlights in blue. The image size is 5×7 and is suitable for framing. It is printed on Arches paper. About letterpress printing: this poster is letterpress printed by hand on a Chandler and Price antique printing press from 1925. Letterpress printing is a type of relief printing invented in the 15th century, and excels at highlighting the sharp contrast between crisp type and soft paper.